RRB Banglore Group D Recruitment 2018-2019: So, the Railway Recruitment Board Banglore released a Notification on their official site at rrbbnc.gov.in. There is total of 2293 Group D Vacancies. So, those people who are interested in working with the Railway Recruitment Board Banglore, can check all the important details, and can proceed to apply for the RRB Banglore Group D Recruitment 2018-2019 before the final date. And the officials of the RRB Banglore asked the contenders, to submit the application form in the prescribed manner, before the final date. And the deadline is 31st March 2018. All the contenders should notice that the organization started accepting the applications for the RRB Banglore Group D Recruitment 2018-2019 from 10th February 2018. keep this in mind and work on to gather all the requirements quickly before the final date. If not you will lose a good chance. All the details are available. So, the RRB Banglore Group D Recruitment 2018-2019 is out for a while. And many of the contenders who are trying for the Government jobs in the Karnataka state do not even know about this. 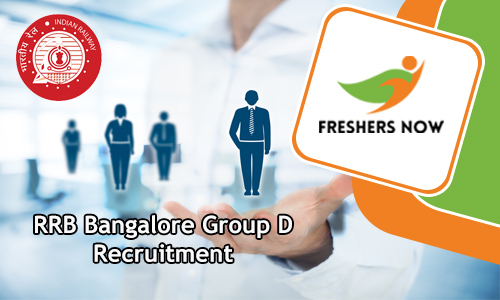 Therefore, to make enough awareness about this latest RRB Banglore Group D Recruitment 2018-2019 Notification, here we are creating this article. All the people who are looking for the Railway jobs should check out the requirements as early as possible, as the deadline is nearing. Now as per the information advertisement, all the people who have finished their 10th class or ITI or its equivalent from NCVT or SCVT in India as the Educational Qualification can apply only after checking remaining information. Remember that without all the requirements, you are not eligible to apply or attend any of the RRB Banglore Group D Recruitment Process. Keep this in mind. So, please some important details in the above table. This will give a brief outline of all the requirements. And still, if you are having any doubts, you can always check the RRB Banglore Group D Recruitment 2018-2019 Notification. Remember you can find the link to download the official notification without searching much. Now, all the people can apply for the Track Maintainer Grade IV (Trackman), Gateman, Pointsman, Helpers in Electrical/ Engineering/ Mechanical/ Signal & Telecommunication departments, Porter & Other Vacancies. Only if they are having all the qualifications correctly. Now after the educational qualification, next important factor is age limit. Now, as per the information in the RRB Banglore Group D Recruitment 2018-2019 Notification, age of the applicants should be between 18 years to 31 years. You can avail some age relaxation. For that age relaxation details, you have to check the advertisement. Now, next important thing all the candidates should be aware of is the application fee. so, as per the data in the advertisement, all the people who are applying before the final date should pay the application fee. Therefore, all the General Category people need to pay Rs.500 as the application fee. While the candidates from the SC/ST/ Ex-serviceman/ Women will pay Rs.250/-. And please spare some time and check the advertisement or the official portal twice before making any payment. And kindly notice that we are only helping the contenders by providing enough data. This RRB Banglore Group D Recruitment 2018-2019 Notification is official, released by the RRB Banglore officials. After submitting the filled application form, before the deadline, the officials of the RRB Banglore, ask the contenders, to attend the Recruitment Rounds. This is only if they are eligible. So, according to the info in the RRB Banglore Group D Recruitment 2018-2019 Notification, candidates should clear, Written Test (Computer Based Test), Physical Efficiency Test (PET), Document Verification, Personal interview. And they will go forward, only if they clear the initial rounds. And this will be possible only if they prepare well. Therefore, keep this in mind and prepare well to crack the test. All the applicants should remember that the competition for these jobs is very high. Therefore they need to practice hard, for which they need Preparation Materials. Which they can find on our site without searching much. In RRB Banglore Group D Recruitment 2018-2019 Notification for 2293 Grade IV Vacancies, rrbbnc.gov.in officials clearly gave the data about the pay scale. Therefore, those people who will get placed will receive Rs.18,000/- per month as the Salary. Though the officials of the RRB Banglore didn’t mention about the Grade pay and other incentives in the advertisement. Our team from the Freshersnow.com tried to give as much information as we can in this article. Though we might miss some information. Therefore, it will be ideal if the contenders check the RRB Banglore Group D Recruitment 2018-2019 Notification twice before making any move. Down in the sections, you will find important details about the Name of the Vacant positions along with the number of positions available, Age limit, Age relaxation, Educational Qualification, Selection Process, Application Fee, Salary, Grade pay. And apart from all these, you will also find a direct link to check the RRB Banglore Group D Recruitment 2018-2019 Notification. And even some simple steps. Also, these steps will help you to apply for the Recruitment easily without any confusion. Therefore, check them all properly. And finally, you all should remember the fact, that the officials will hire an individual as per the performance in the Recruitment rounds only. 10th class or ITI or its equivalent from NCVT or SCVT in India as the required educational qualification.